Some specific foods known to have the ability to ward off disease. Nutritionists call it a super food. Here is a 7 (seven) to get the best food in your diet program, especially for women to prevent the risk of diseases such as osteoporosis, heart disease, cancer of the cervix, and breast cancer. As is known, the red fruit is rich in lycopene content that plays an important role in warding off breast and cervical cancer. Even a study showed the consumption of tomato can be heart healthy. After looking at almost 40,000 women, researchers from Boston concluded, lycopene also protects the heart. To increase levels of antioxidants and lycopene, are advised to eat tomatoes after cooking. Flax seed (a type of hemp, such as sesame, Linum usitatissimum) is a food rich in benefits. Flax is basically divided into two varieties, the brown and golden flax. Flax is usually turned to industrial linen and linseed oil. The experts from the Mayo Clinic found that 40 grams of flaxseed can reduce the symptoms of heat stroke are often experienced by menopausal women. Some reports indicate hemp can lower "bad" cholesterol or LDL and triglycerides. In a study in China known to the more obvious benefits in women. Meanwhile, in brown or golden flax, play a role in the fight against breast cancer. Warning: Pregnant women and nursing mothers should not be eating flaxseed. Many health benefits can be obtained from the vegetable on this one, especially for women. Cabbage contains antioxidants such as lutein and zeazanthin that serves to protect the eyes. In addition, cabbage is also a good mengadung vitamin K in bone builder. The researchers found that women who eat a diet rich in vitamin K, have a lower risk of hip fracture. 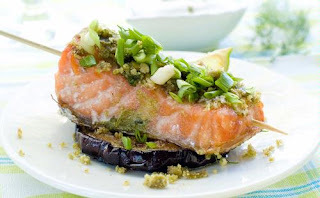 Salmon is included in the omega-3 smber best. In pregnant women, studies show that fish oil (omega-3) also helped in overcoming postpartum sadness. Other benefits include improving the function of neural connections in the brain of the fetus. Cranberry is a natural remedy that is believed to treat urinary tract infections UTI in women and has been widely recommended by experts. This fruit contains antioxidants that work to prevent bacteria from sticking to the bladder wall, which is a breeding ground for bacteria and cause infection. The findings are based on results of recent studies that examined the concentration of cranberry extract. The right dose: Varies. But you should drink cranberry juice that is 100 percent fresh (60 calories per cup) to avoid excess sugar. Most of of you might not know much about Greek Yogurt. Yogurt is different from yogurt in general. Greek yogurt offers twice the protein is better (than other types of yogurt) with a little sugar. Low levels of carbohydrates also helps us keep the blood sugar remains stable. In addition, studies show that foods with high protein levels (30 percent of calories) helps women to lose weight and maintain muscle. Recent studies have shown, only eating two ounces of walnuts per day to help slow the progression of breast cancer and slow tumor growth (results of tests on mice). Walnuts contain an antioxidant called phytosterols, which have an important role in the fight against cancer. In fact, omega-3 fats in walnuts effective in preventing excessive bone turnover that makes bones strong and healthy.